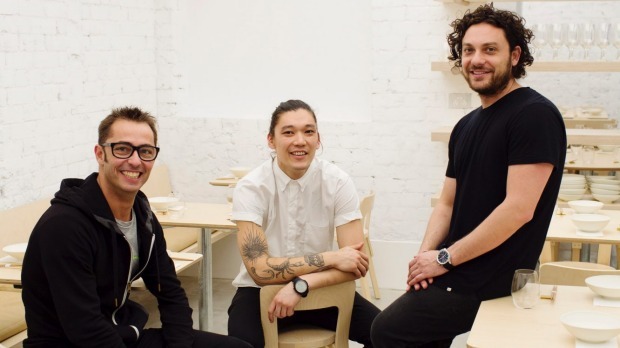 Good Food: Nic Wong, centre, with Sam Christie, left, and Jonathan Barthelmess at Cho Cho San restaurant, Potts Point. Photo: James Brickwood. 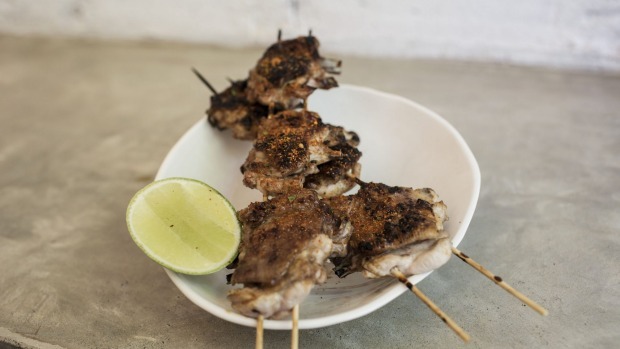 Chicken, skewers, glaze and charcoal – it's the simplicity of yakitori from side-street vendors in Tokyo that gets Nicholas Wong from Potts Point's Cho Cho San every time. "There's this old couple who must be in their 80s – they skewer all day and cook all night," the head chef says. "It's amazing. Every time I go to Japan I definitely go there. It's very unassuming." Yet while yakitori, which commonly refers to grilled chicken on skewers, has distinctly Japanese origins, it's the international appeal of the dish that most appeals. "Chicken wings and beer go hand in hand, they're pretty universal in any cuisine," Wong says. Wong is cooking this dish at Good Food Month's Asia Town street food festival on October 19 in Sydney. He shared the recipe and tips with goodfood.com.au. In terms of cooking yakitori, nothing beats a charcoal grill. Wong is no purist, however – a frypan, oven grill or barbecue hotplate will work just fine. Just cook on high for the first minute or two so the skin crisps up nicely, then turn the heat down to medium while the flesh cooks. "Obviously the advantage [of the charcoal grill] is the taste, the smell – it definitely enhances flavour of food," Wong says. "Look for a nice, glowing middle and a white ash on the outside." He suggests opting for the best-quality charcoal you can afford and steering clear of cheap Heat Beads that use fuel tablets, which give off an unpleasant odour. But remember that expensive charcoal tends to need an open flame to light properly, such as from a gas stove. Also make sure you give the meat a bit of space from the charcoal to prevent burning the skewers and soy sauce. A 10-centimetre distance is ideal. One of the items on Cho Cho San's original menu was a yakitori-inspired dish without skewers using chicken Maryland; Wong is considering another yakitori-style option for the coming summer. For Asia Town street food festival, however, he'll be serving a simpler concept using chicken mid-wings – also known as wingettes – which are essentially chicken wings with the tip and wing drum removed. They're available at some supermarkets or butcher's shops but you can easily make your own by chopping off the ends at home. Whether you buy whole wings or mid-wings, you still need to remove the joints at either end and cut the wing open flat before threading it onto the skewers (see instructions below). The best way to find where the knuckles are is by feeling around the bone, then placing the knife just inside the edge of the joint. Saw slightly into the flesh, then thump the knife down through the bone with the heel of your hand. Watch a demonstration in the video above. Score the flesh above the bone, then massage the wing open with your thumbs and it should appear fairly flat and roughly rectangular, ready for skewering. It's important while threading your chicken onto the skewers not to pierce the skin, otherwise you may burn the wood – never a good look (or taste) no matter how much you love that charred flavour. It's a slightly tricky technique, best mastered through observation and practice, Wong says, so watch the video above if in doubt.